(AFP) - An operation was underway Thursday to try to stop a Norwegian navy frigate from sinking after it collided with a Maltese oil tanker in a fjord in western Norway. Eight people received minor injuries in the accident, which took place shortly after 4:00 am (0300 GMT) in a busy waterway in the Hjeltefjord near Bergen, Norway's army said. 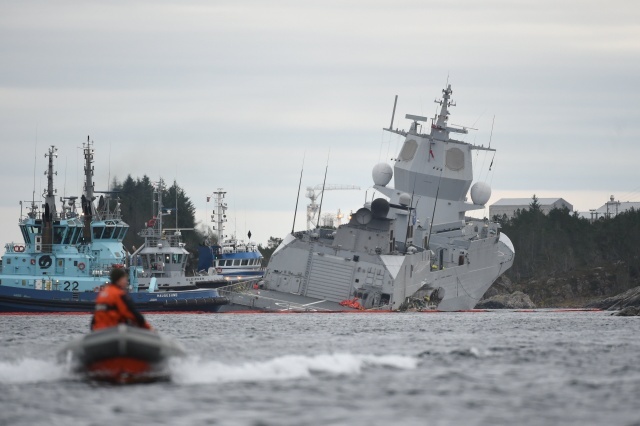 The 137 people on board the KNM Helge Ingstad frigate, which was returning from NATO's Trident Juncture exercises, have been evacuated after the collision with the Sola TS tanker, the army said. Images of the frigate published online and broadcast on television showed the frigate was partly underwater and had been moved near the shore. "We are doing everything we can to save the ship," Lieutenant Colonel Ivar Moen told AFP. "All available means have been mobilised," he added. The 62,000-tonne tanker, which was flying the Maltese flag, was only slightly damaged and none of the 23 people on board were injured, the rescue centre said. It is now waiting to be towed to a nearby oil terminal. According to the Norwegian Coastal Administration, a 10-cubic metre helicopter fuel tank on the frigate was ruptured. "The leaked amount has not been determined," it said. Tug boats were being used to drag the ship towards the shoreline, in an effort to keep it from sinking in the deep, busy waterway. Norway's Accident Investigation Board has launched an investigation into the collision, which also involved a tugboat.